The echinoderms have prickly skins. 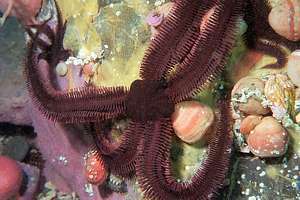 On this page you can identify the intertidal echinoderms found on the rocky shore and in tide pools: sea urchins, starfish and sea cucumbers. None of these can live out of the water for prolonged times but inside rock pools they have excellent survival skills. 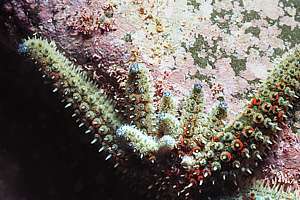 The echinoderms are the sea urchins, starfish and sea cucumbers. They have a hard exoskeleton and usually sharp spines. The most distinctive feature of echinoderms is an elaborate water pumping (hydraulic) system which operates their many tubefeet and spines. Echinoderms have no part that can be called a head. f036909: the green urchin (Evechinus chloroticus) [kina] derives its name from its green test (shell) even though it may look brown to red on the outside. It is a voracious grazer but on the rocky shore it is usually found hiding under stones. The animals found here are usually small and young, and move to the deep as they grow larger. f019029: with its many tube feet, a sea urchin attaches firmly to the rock. 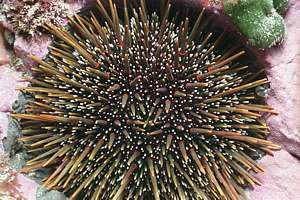 It has tubefeet between its spines too, and with these it can catch seaweed that is floating by. 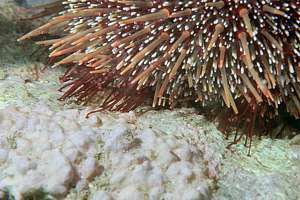 Sea urchins are commonly seen holding seaweed on their backs for later use, or stones, perhaps for protection against wavewash and being sand-blasted. 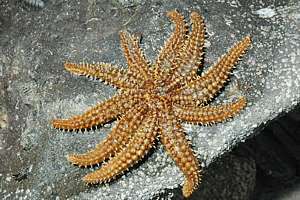 0609167: the largest star on the rocky shore is the prickly eleven-armed star (Coscinasterias calamaria) [pekapeka, papatangaroa]. It is a hungry predator, eating a wide range of prey from shells to sea urchins. Its main predator is the triton conch (Charonia capax) which pins one of its arms down. The star then voluntarily severs its arm in order to escape. Lost arms regrow fully.THis one already lost one arm. f019020: this splitting star is also an eleven-armed star and is thought to be Coscinasterias muricata. It has the habit of staying small by splitting itself in half and then regrowing the missing arms, even though it may not end up with eleven arms. f037020: closeup of 7 arms regrowing on a splitting star. f036135: the sturdy reef star (Stichaster australis) [pekapeka, patangaroa] is found mainly on the West Coast and along the South Island where it survives the low tide. It has eleven arms that are not prone to splitting. It is a fierce predator. the seven-armed prickly star (Astrostole scabra) [tangaroa wae whitu] is not found in the intertidal. 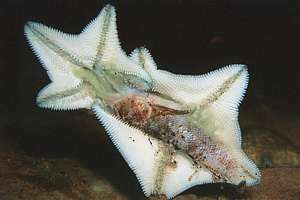 It is the largest sea star in NZ, with arms extending to 75cm. It is also a fierce predator of other echinoderms: sea urchins and starfish. 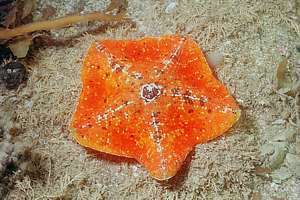 the orange splitting star (Allostichaster insignis) (150mm) is bright orange with usually 3 large and 3 smaller arms as it splits when reproducing asexually. Mainly South Island. 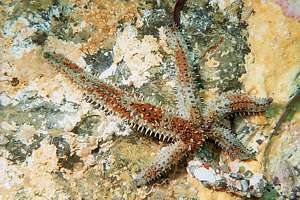 the four-n-four star (Allostichaster polyplax) has two sets of four arms, is brownish with orange tubefeet. Mainly South Island. 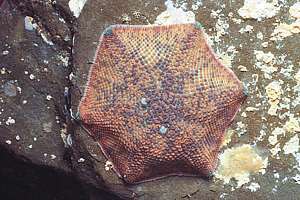 the brooch star (Diplodontias dilatatus) (Asterodon dilatatus) (70mm) is a stiff star with an outline of rectangular plates. It is variable in colour but always creamy white below. South from Cook Strait. f037016: the common cushion star (Patiriella regularis) [kapu parahua] is an extraordinary animal because it has such a varied diet as predator, scavenger, grazer and detritus feeder. It can do so by extending its stomach over its food and digesting it outside its body. It normally has five arms but the animal shown here has six, and it also has two madrepore plates (whitish dots). Two species of Patiriella have so far been identified. f992830: two cushion stars competing for the same dead triplefin on an aquarium window. The big one claims most of the quarry by covering it as well as it can. It has its (green) stomach all over most of the fish. All the while, the little star is muscling in on the head of the fish, extending its (green) stomach as far as it can. They may remain in this position for a week until they give up or the food is wholly digested. f050221: the elevated cushionstar (Stegnaster inflatus) [kapu parahua rahi] is also called ambush star because of the way it catches its food. It looks like the common cushion star but is very colourful (white yellow orange red purple blue green) in all kinds of spotted combinations. Its top surface feels slimy while its bottom surface feels raspy with spines centred towards the middle. In this manner prey will end up centred under the mouth. f036107: here the ambush star (Stegnaster inflatus) has its trap set by standing high on the tips of its arms, creating a 'safe' shelter underneath its body. But the moment its belly is tickled, the trap springs as it closes the side flaps amazingly quickly. The victim is then digested in the hermetically sealed space under its belly. It is amazingly effective in catching snails of all kind, shrimps and even seahorses and small fishes! Ocnus brevidentis, a small white seacucumber of up to 2cm can sometimes be found under submerged rocks and between kelp holdfasts. Trochodota dendyi is a finger-long sea cucmber that burrows up to 20cm deep into sand. It is found inside estuaries. 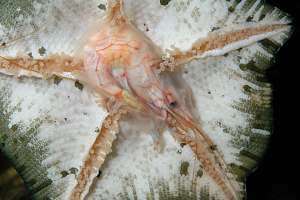 0703004: an ambush star (Stegnaster inflatus) has trapped a large common prawn (Palaemon affinis) and has extruded its stomach entirely around it. Within 8 days it will have digested the whole shrimp, including its shell. f018916: a young sea cucumber (Australostichopus mollis) looks prickly but is in fact quite soft to the touch. 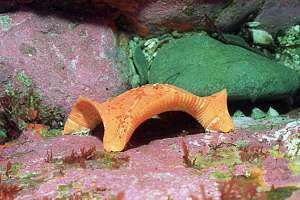 It is not commonly found in rock pools as it prefers calmer water. 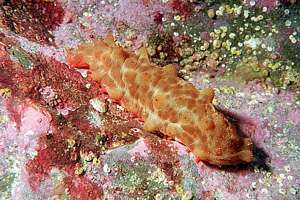 Sea cucumbers eat detritus and are numerous where raw sewage enters the sea. Its main predator is the large cask shell Tonna cerevisina, not found in the intertidal, as it needs deep sand for burrowing. 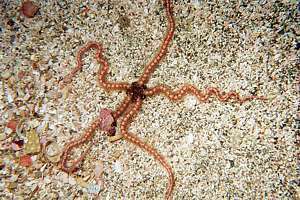 Brittle stars have long slender arms with which they walk. They can move quite rapidly after having been exposed. As their name suggests, they are rather 'brittle', easily breaking an arm or two. They do so voluntarily when threatened. The severed arm wriggles to call attention away from the star, fleeing for its safety. Lost arms can be regrown completely. When handling a brittle star, be very gentle and hold the star by its centre disc, rather than by its arms. 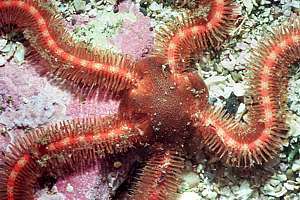 Brittle stars are quite amazing because they are able to catch plankton and fine plankton detritus with mucus, which is transported by their tube feet from the ends of their arms to their mouths in the middle. 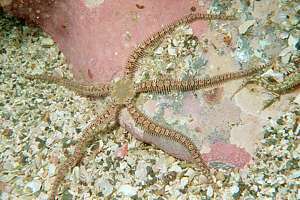 Brittle stars are also called sand stars. f019023: the mottled brittlestar (Ophionereis fasciata) [weki huna] does not move by means of its tubefeet but walks on its arms quickly to safety. It is seldom found in the open, but lives underneath stones or inside cavities from where it extends its arms. It feeds on plankton and detritus. Food sticks to mucus and is then transported to the central mouth by many almost invisible tubefeet. f019034: an oar star (Ophiopteris antipodum) has flat spines that loook like rowing-oars. 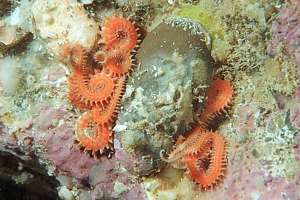 Although it looks deceptively more solid than the mottled brittlestar, it nonetheless easily breaks its arms off. 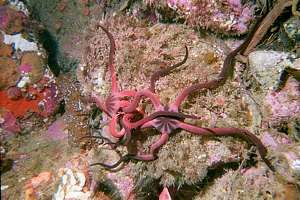 It is the fastest moving brittle star. f018909: the red-checkered brittle star (Ophiocoma bollonsi?, amphiura rosea?) [weki riki]has very long legs. f04053: detail of the disc of a red-checkered sand star. f018914: orange heart sand star (?) is rarely found as it prefers deeper water. The brown patches are colonies of bryozoa. The dark holes are date shell burrows. f019027: an orange brittle star is firmly lodged behind a pebble under a large boulder, from where it extends its arms to catch food. f027427: two snake stars in a dispute, on open terrain. 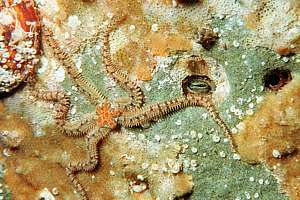 The snake star (Pectinura maculata) [weki] is a most unusual brittlestar. It has long, rounded arms which do not break off easily and it gives live birth! In an aquarium it takes food from one's hand by coiling the tip of an arm around it and bringing the tip of its arm to its mouth. 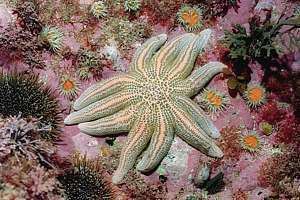 The snake star is rarely found in rock pools as it prefers deeper water where it lives under big stones.